Joseph Gary Sheahan, a military artist, created this illustration in 1944. It is online, courtesy the U.S. Army Center of Military History. Click on the image for a better view. What was the situation at Omaha Beach? Much the same as the other four beaches where Allied soldiers braved artillery fire, mortar attacks and all-around danger. Let's take a look at what they endured that day. Before D-Day, German 75-mm guns were in place (see the foreground of this picture) on Omaha Beach. The difficult terrain at Omaha Beach was, in many places, impassable for vehicles and included bluffs west of Vierville Draw. In addition to natural barriers at Vierville Draw (and elsewhere), landing troops had to contend with German-built "pillboxes," which shielded enemy guns aimed at approaching Allies. The artificial "port," created off Vierville Draw, was destroyed two weeks later during the massive storm of June 21st. Les Moulins Draw area, viewed from the east. Troops ferried to Omaha Beach carried M1903 rifles and M1 carbines. After the landings, sunken ships formed a breakwater just off Les Moulins Draw. Men of the 1st Division, loaded with equipment, waded through the cold surf toward shore. Other assault troops left the relative safety of their transport vessels and headed toward confrontation on the beach. V Corps' D-Day operations at the Omaha Beachhead. 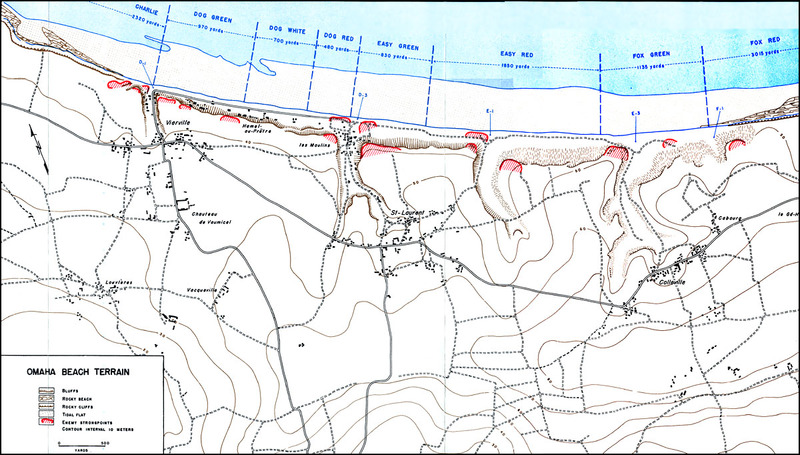 Heavy fighting took place at "Fox Green Beach" in the eastern half of Omaha Beach. Reinforcements (men and equipment) moved inland during the build-up at Omaha Beach known, to some, as "The Tough Beach." LSTs, grounded on the beach, allowed equipment to be offloaded directly on shore. Despite setbacks, the Omaha Beach assault troops achieved success, although the outcome of their objectives was not clear by the end of June 6th. An aerial view of Omaha Beach the day after D-Day. Thousands of Allies, who attempted D-Day landings, remained in France. The quiet of their final resting place tells us little of the horrors of their deaths. Bos, Carole "OMAHA BEACH" AwesomeStories.com. May 01, 2004. Apr 24, 2019. Is It a Good Idea to Recreate War Scenes in Film?